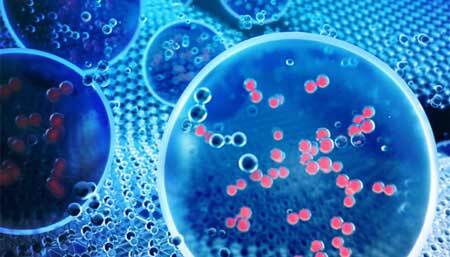 (Nanowerk News) Lawrence Livermore scientists have developed a technique that helps extract hydrogen from water efficiently and cheaply. Hydrogen can be used as a clean fuel in fuel cells, which produce power with water and heat as the only byproducts. As a zero-emission fuel, the hydrogen can be recombined with oxygen to produce electric power on demand, such as onboard a fuel-cell vehicle. The Livermore team and collaborators at Rice University and San Diego State University turned to electricity to produce clean hydrogen fuel by splitting water molecules, which are made of oxygen and hydrogen atoms. The researchers discovered a new class of cheap and efficient catalyst to facilitate the water splitting process. The research appears in the July 31 edition of Nature Energy ("Self-optimizing, highly surface-active layered metal dichalcogenide catalysts for hydrogen evolution"). "Hydrogen gas has immense potential as a source of sustainable fuel, because it generates no carbon emissions," said Lawrence Livermore lead author Brandon Wood. "It can be produced from multiple sources, but the holy grail is to make it from water." Wood also is a principal investigator in the Department of Energy Office of Energy Efficiency and Renewable Energy's (EERE) HydroGEN Advanced Water Splitting Materials Consortium, an Energy Materials Network node focused on hydrogen production from water. Extracting hydrogen from water using electricity is a fairly straightforward process, but it is inefficient and usually takes a lot of energy. The efficiency can be improved using catalysts, which are often made of expensive precious metals, such as platinum. The Lawrence Livermore team sought to come up with a cheaper way to efficiently split the water molecules. To solve the problem, Wood and lead author Yuanyue Liu -- a Livermore summer intern with Wood -- turned to a class of catalysts based on transition-metal dichalcogenides (MX2), which have generated a great deal of interest for water splitting. The issue with the MX2 materials that currently are used (based on molybdenum and tungsten) is that only the exposed edges of the catalysts are active. Instead, Wood, Liu and colleagues used quantum-mechanical calculations to reveal underlying electronic factors that would make the entire surfaces of the MX2 materials active for catalysis. These "descriptors" were then used to computationally screen MX2 candidates that could make better water-splitting catalysts. Researchers from Rice University experimentally validated the calculations by synthesizing and testing two of the proposed materials, tantalum disulfide and niobium disulfide. Beyond confirming that the materials' surfaces were active towards water splitting, they discovered that the materials had an unusual ability to optimize their shape as they evolved hydrogen gas. This allowed the materials to achieve even better performance. "The self-optimizing behavior and surface activity mean high performance can be achieved with only minimal catalyst loading," Wood said. "It's a huge advantage for scalable processing, since there's no need to turn to expensive techniques like nanostructuring. Our work opens the door to using this type of catalyst, and our theoretical descriptor should make it easy to assess water-splitting activity in similar classes of layered materials."